● Shift to and depress the brake pedal when starting the engine. Turn off or start the engine. Transmission is locked. Normal driving. 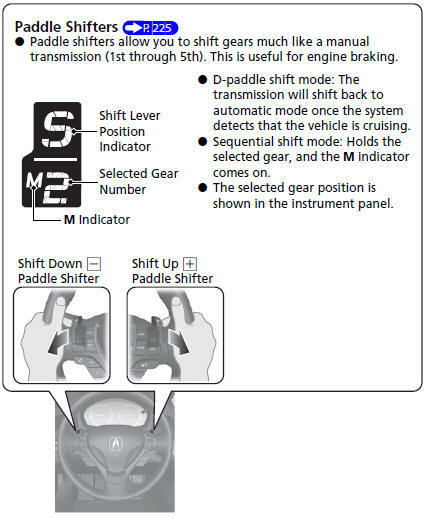 D-paddle shift mode can be used. Depress the brake pedal and press the release button to move out of . 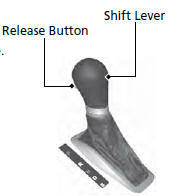 Press the release button to move the shift lever. Move the shift lever without pressing the release button. (P 233) ● The vehicle stability assist (VSA®) system helps stabilize the vehicle during cornering, and helps maintain traction while accelerating on loose or slippery road surfaces. ● VSA® comes on automatically every time you start the engine. ● To turn VSA® on or off, press and hold the button until you hear a beep. ● Cruise control allows you to maintain a set speed without keeping your foot on the accelerator pedal. ● To use cruise control, press the CRUISE button, then press DECEL/SET once you have achieved the desired speed (above 25 mph or 40 km/h). TPMS monitors tire pressure. ● TPMS is turned on automatically every time you start the engine. 1. Push the fuel fill door release handle. 2. 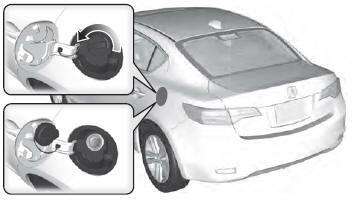 Turn the fuel fill cap slowly to remove the cap. 3. Place the cap in the holder on the fuel fill door. 4. After refueling, screw the cap back on until it clicks at least once.